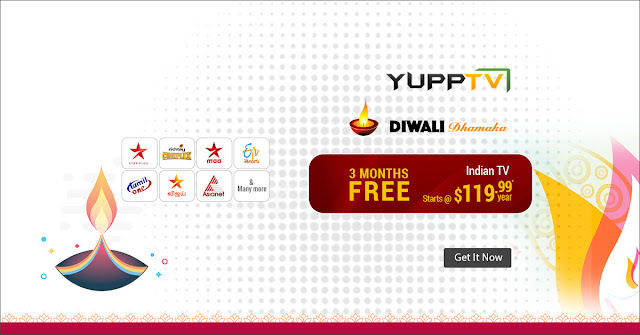 YuppTV is making the Diwali Extra Special by offering the customers a 3-month free Subscription on a yearly package. Get all of the Indian TV Channels along with the newly launched TBO for 15 months instead of 12 for the same price. Illuminated with the special Lamps for Diwali, the Indian sector of Singapore just got brighter with YuppTV’s latest offer. Along with the best of Indian TV Channels like Star Vijay, Star Plus, Colors TV, Zee TV, etc., YuppTV now offers Popular Movies, TV Serials, Shows and Web Series through YuppTV’s very own TBO, MBO, BBO and KBO channels. What’s so special about the new channels? Star Vijay which was unavailable to the Singapore populace until recently is now live and at your reach providing you all the Tamil content you need. Likely the best among the Hindi Channels, Star Plus is now available in Singapore. The launch of Colors TV on YuppTV enables the viewers to watch the Bigg Boss- Hindi show hosted by Salman Khan. In addition to this, Zee TV which has renewed its logo after 25 years is ready to launch some brand-new shows along with the present ones which are the top-rated ones. Zee TV’s top serials KumKum Bhagya, Kundali Bhagya, Sa Re Ga Ma Pa, are now accessible all week. Sa Re Ga Ma Pa which is one of the best singing shows in the entire Hindi Singing Reality platform is launching soon on Zee Tamizh. Get access to this amazing show and a whole new range of TV serials on Zee Tamil. YuppTV’s newly launched web series “Mana Mugguri Love Story” is broadcast on our Telugu channel TBO (Tollywood Box Office). You can even watch latest Telugu movies on this channel in HD quality and with super synced subtitles. Other YuppTV channels like KBO, BBO, and MBO offer the newest blockbuster movies with subtitles. The launch of these channels broke the barriers of language that restricted our access to the best of movies from other languages. All the channels are now accessible for an extra three months at the same price of a year’s subscription. So, make the most of this Diwali Special offers. YuppTV wishes you a Warm and Memorable Diwali.